Welcome to the ceilidh collective! Tickets for all our events are available here. 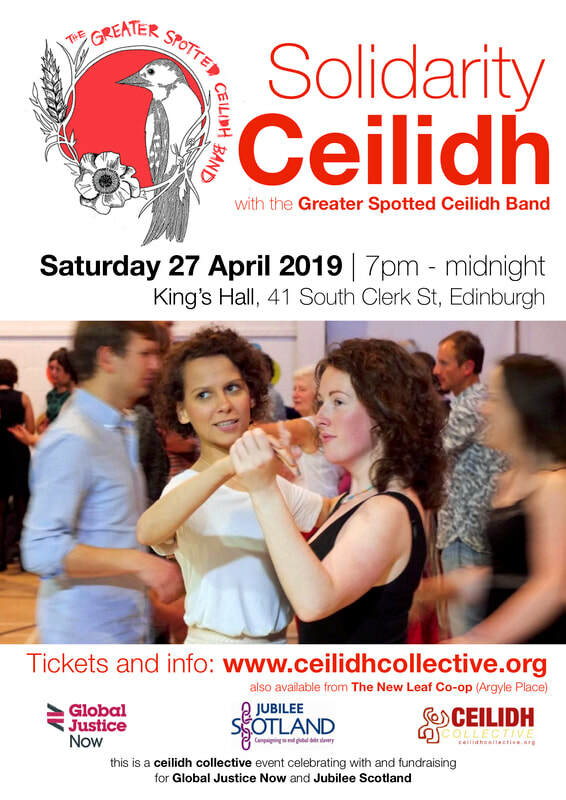 Sat 27 Apr 2019 - The Greater Spotted Ceilidh Band. Solidarity Ceilidh. Fundraising for Global Justice Now and Jubilee Scotland. The King's Hall. With room for 180 guests and our first full ceilidh with the Greater Spotted, we're very excited to be returning to the carpeted delights of The King's Hall. We'll have our full licensed bar and raffle, and sweet and savoury food available for sale from 7pm for early arrivals. To keep you informed of the events we run (and those associated with us) we send out up to two emails per event. ​To get on the mailing list please just add your email address in the box below. You can unsubscribe at any time by clicking the link at the bottom of each email. See details of our our recent events here. If you'd like to volunteer to make sure they all happen head here and help us make it so! Four hours work on the night in exchange for hot food, a drink and free entry to the ceilidh. Best ceilidh deal in town! As soon as tickets are made available you can buy tickets for the next ceilidh collective events from Brown Paper Tickets. Alternatively, and avoiding booking fees, you can pop along to the wonderful people at New Leaf Co-op on Argyle Place, Edinburgh. They provide an amazing box office service in exchange for five tickets per ceilidh from us. In their words they are "Edinburgh's local, unpackaged, scoop your own, nut-grinding, organic, worker-run co-operative putting affordable local, ethical food first". They are more than well worth supporting and using. You can't get more right-on and what a treat to speak to people who really know a lot about food, their suppliers and the local area!